Hey, Phone: Oof. Man, this isn’t gonna be easy. But both you and I know this has been coming for a while now. This just isn’t working out. And I thought I should let you know: I’m seeing a new phone. I mean, there are a ga-jillion reasons why it’s come to this: You’re bulky compared to newer phones; you drop calls like nobody's business; your battery seems to die every 10 minutes. But you and I both know the real reason it’s come to this: You’re not water-resistant. Last month, when I dropped you in the john by accident, I assumed it’d be no big deal. WRONG. You stopped working on me! I didn’t see that coming. It was straight-up messed up. You had a lot of nerve, quitting on me like that. All my friends asked me, “Hey bro, why isn’t your phone working?” And I was forced to lie. I told everyone I dropped you in a puddle while I was helping an elderly woman cross the street. There’s no way I could tell them the truth, that I fished you out of the toilet. That’s just shameful. And horrifically disgusting. Everyone and their brother tried to tell me how to fix you when you got wet: “Put it in a bowl of uncooked rice for three days,” a co-worker told me. That didn’t work. “Run it over with a vacuum cleaner,” someone else said. No luck with that, either. But with this new phone I’m seeing, there’s no need to rely on some cockamamie remedy to repair it if it gets wet, because hey man, it’s water-resistant. Yeah, we had some good times, but I’m gonna have much better times with my new phone. Think of everything we can do together. My new phone can sit on the counter while I do dishes and I won’t have to worry that it’s gonna get soaked. And we can walk through the rain and get as goddamn wet as we want. I never got to do that with you. I’m sorry if it hurts to hear this, but sometimes the truth about a water-resistant phone hurts. Listen, I just felt like I owed you an explanation — but I don’t have all day to sit here and tell you how awesome this new phone I’m seeing is. Actually, I’m running late for a date with my new phone. We’re going kayaking together in a lake upstate. It’s gonna be super romantic. We’ll take a ton of selfies together. Then we might enjoy a glass of wine. And if I spill the wine on my new phone, who cares? It can handle that. I’m truly sorry it had to end this way. If you ever magically become water-resistant, give me a call. Give a proper send-off to your sad sack of a smartphone on July 27 at the Summer Soaker event that’s being held right here at the Gawker HQ rooftop in partnership with Sony Xperia Z— a colorful and capable phone that's totally wife material. 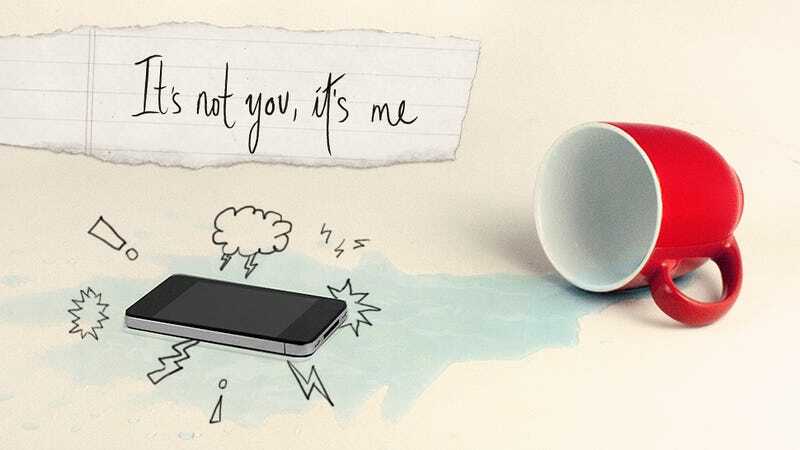 For a chance to attend, tweet a link to your favorite smartphone breakup letter (use this link to vote for the first letter in our series, this link for the second letter in our series, and this link for the letter you just read) with the hashtag #summersoaker. There will be food, drinks, water guns, and the chance to win a new Sony Xperia Z because, let's face it — you're too young to settle. Alex Scordelis is a contributing editor at Paper Magazine and a writer at UCB Theatre.